There are many states that allow their notaries to certify copies of documents. In most cases, your state will require a certain verbiage or notarial "form" to be on the copied document to authenticate it. You cannot always plan on having that pre-determined text to be on the documents you are copying so you may have to write it all out. As a notary, it is important to be knowledgeable about all the notary rules and laws in your state as well as to be prepared with the proper tools. We created the MaxLight X Notary Certified Copy stamp for instances where the notarial verbiage is not pre-printed on your clients' documents. Unsure if this stamp is acceptable in your state or will work for your notarial duties? Contact us! 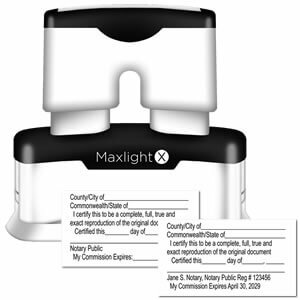 The MaxLight X Notary Certified Copy stamp is a great tool for any notary - whether you're just starting out or an experienced notary public. With just a small amount of pressure to the top of the MaxLight X Notary Certified Copy stamp's handle, you can receive flawless and professional-looking impressions every time. The MaxLight X Notary Certified Copy stamp is an eco-friendly stamp that never requires the use of replacement ink pads. The built-in inkwell is large enough to supply you with over 50,000 crisp impressions without needing to re-ink. The MaxLight X Notary Certified Copy stamp will impress both you and your clients!